Two more travel agencies have been rewarded for their proactive cruise promotions during Cruise Lines International Association (CLIA) Australasia’s month-long #ChooseCruise campaign. After running an extensive #ChooseCruise campaign during October, including a cruise event, weekly themed eDMs and social media posts, Saide Jebrine and Anita Andonovska from itravel Carlingford are looking forward to an exclusive dining experience onboard PONANT’s Le Laperouse in Sydney next year. Itravel Carlingford owner Emily Kadinski said #ChooseCruise was an easy campaign to support. 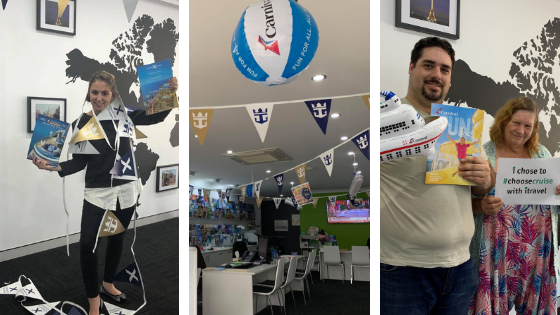 “For the month of October, itravel Carlingford has had so much fun promoting #ChooseCruise with online marketing, instore events and crazy decorating days. The campaign brings in a wide range of new and existing clients who want to book ocean, luxury, river and expedition cruises,” Emily said. “Cruising is an amazing holiday. You unpack once, all your meals and entertainment are included and best of all, not only are the ports the destination, the ship is the biggest destination of all. Why wouldn’t you choose cruise? Helloworld Lambton Quay Wellington has also been rewarded for a fantastic #ChooseCruise campaign, with the New Zealand agency receiving two tickets to Cruise360 2019. With a focus on expedition cruises in the final week of #ChooseCruise, the travel agencies with the most creative and innovative campaigns will be in the running to win a seven-night Tasmania cruise with Coral Expeditions and a $500 Breakaway Travelclub voucher. Agents are encouraged to include @cliaaustralasia and #ChooseCruise in any social and online activities. Details of offline activities can be emailed to Vera Pajovic at vpajovic@cruising.org by 4pm on October 30. Why use a CLIA Agent?